Without a doubt, the ones that help me the most are the many wonderful nurses that I have worked with over the years. Without the help of these hard working people, who often have to carry out the most menial and unpleasant tasks, there is simply no way that my patients could get the care they deserve. This is why the current treatment of nurses by the Ontario Government is so appalling and offensive to me. It's been my pleasure and a privilege to be a Rural Family Physician for the past 23 years. Over that time I have had the opportunity to deliver babies, work in the Emergency department, take care of critically ill patients in the Intensive Care Unit, assist in surgery and provide palliative care to my patients during the last stage of their lives. My profession has many emotional ups and downs, long hours and ongoing frustrations with paperwork and bureaucracy, but when I see the smile on the face of a young child who's gotten better from an illness, or the see the joy in the face of a patient whom I have discharged from hospital, or even experience the gratitude of the family of a family who's loved one was able to pass more comfortably, I can truly feel a immense sense of satisfaction that makes it all worthwhile. Now to be fair, there is no way I could do everything all by myself. Without a doubt, the ones that help me the most are the many wonderful nurses that I have worked with over the years. Without the help of these hard working people, who often have to carry out the most menial and unpleasant tasks ("Yes, Nurse, I do want the patient to have yet another soap suds enema! "), there is simply no way that my patients could get the care they deserve. This is why the current treatment of nurses by the Ontario Government is so appalling and offensive to me. The Ontario Government has an agenda. They want to shift more care to patients home. This makes sense financially, as it's over $800 dollars a day cheaper to look after patients in the home than in the hospital. This makes sense medically, as patients who are able to be cared for at home often have better outcomes (albeit modestly). So clearly, this is a move that needs to be looked at. The problem is that it is happening in too slipshod a manner, and without recognizing that we've actually made a huge shift in that direction already. Currently, Ontario has about 1.7 hospital beds per 1,000 population, which is half the average of the 34 OECD countries. Not only that, in Ontario we've reduced the number of acute care beds by 17,000 since the 1990's. All of this was done at a time when the population of Ontario grew from 10.5 million in 1991 to approximately 13.8 million today. Not to mention that the percentage of seniors (the group that uses the highest amount of health care resources) also rose from about 11 per cent in 1990 to 15.2 per cent today. So clearly, Ontario has already implemented significant steps towards reducing hospital care and increasing home care. The people who bore the brunt of these bed reductions are of course, the nurses. I think it's self evident to suggest that it takes nurses to staff a hospital bed. If you get rid of 17,000 hospital beds, well, then you lose the nurses required to staff them. While it is true that some of the nurses have gotten jobs elsewhere (e.g. in Home Care, outpatient clinics or the like), the reality is that there are still, on a per capita basis, fewer nurses now then there were in 1990. In fact, Ontario has the second lowest RN to population ratio of all provinces in Canada. While it is true that a lot of the work has been transferred to unregulated aides/assistants and so on, the reduction in nursing numbers should be sending up alarm bells for the people of Ontario, particularly since our growing population is clearly aging and will need more Health Care services in the future. Not only are nurses dealing with the fact that there are fewer of them to treat a more complex, aging population, they also have to deal with the fact that their profession now is known for work place violence. I was shocked to hear that there were more reported incidents of violence against nurses in Canada, than police officers and firefighters COMBINED. This is clearly an unacceptable situation and not enough is being done to address this. Furthermore, the nursing profession has to deal with it's own aging demographics. The average age of nurses is now over 45 with one quarter over 55. The same study also suggests that we are training about 2000 less nurses a year than required to fill that gap. 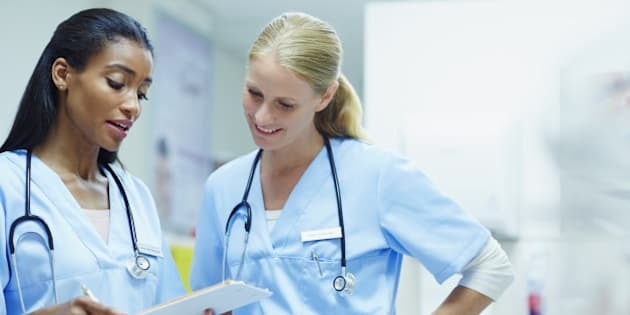 Fewer job prospects, being replaced by unlicensed workers, higher workplace violence, an increasing complexity of patient caseloads, decreased hope for newer replacement nurses coming to fill their role; is it any wonder that nurses also have a high rate of burnout from their profession? Now most people would look at these facts and realize that we have an emerging nursing crisis on our hands and try to figure a way to solve this. There's actually proof that a collaborative approach can work. Research to Action, was a project with an unprecedented level of co-operation between governments, employers, nursing unions and universities. These pilot projects, from 2009-2011, showed a 10 per cent reduction in overtime, reduction in absenteeism and turnover costs and a 147 per cent increase in the number of nurses reporting a high level of leadership and support. What's that you say? That was four years ago? Surely the government has continued to collaborate with nurses since, you know, collaboration works? Turns out the answer is no. For some reason, Health Minister Eric Hoskins and Premier Kathleen Wynne continue to ignore the crisis in nursing. Media release after media release on the Nurses Association web page list stories of one scuffle after another with employers and government. The effect of all these battles is telling, as 12,000 nurses have left the profession this past year in Ontario. Minister Hoskins and Premier Wynne need to stand down from their unilateral cuts to nursing. They need to heed the lessons learned from Research to Action and sit down and talk to the nurses. A collaborative solution is needed here to address this crisis. The people of Ontario expect, and deserve, no less.